Hello all, I'm new here and I need your help.. I'm restoring a levin 86..
and swap 4age 20v engine. Everything working fine here but.. When I bought the engine all pulleys are missing so I decided to buy from T3 Crank Pulley. When we start the engine, sound is fine but after 5 min later My headers GLOWINGG! Like F1 car. I think my timing is wrong, When I tried to set pulley for 12:00, My first piston is not in dead position so decided to use on crank pulley's mark set to 10 degree, but again glowing manifold..
My afr is 13.3 13.0 bytheway weird, car runing perfectly but again headers glowing..
Last edited by Mehmaddict on Thu Oct 12, 2017 11:30 pm, edited 1 time in total. Most likely retarded ignition timing. Possibly a cam timing issue, too much overlap at TDC and some of the inlet charge is going straight into the exhaust. If the actual engine timing (not ignition timing) is correct have a look at VVT settings. There is not notch for 4age 20v onT3 Crank pulley, the tell me about positions I tried them It s wrong When we painted at 12:00 position, TDC dont match. So I want the try this, please tell me I'm doing right or not I dont want to blown the engine I'm noob. For the finding TDC, Turn the crank , find 3 spots on cams and match them on engine and paint new notch on the crank pulley at 0 angle position. Then start the engine setup for 10 degree for advance? Ok so TDC happens twice in the cycle, once when the valves overlap, exhaust closing and inlet opening and the second time on the compression stroke. The compression stroke timing event is the one you are interested in for ignition timing. I'm not familiar with camshaft markings on the 20v engine so I would be checking the timing by removing the cam covers and turning the engine over by hand, a wrench on the crank pulley. You looking for both inlet and exhaust valves to be closed, the non pointy bit of the cam away from the follower (i.e not lifting the valve) and for the piston on the cylinder you are checking to be coming up the bore to the top, when the piston reaches the exact top you will be at TDC on the compression stroke and it is this point that the bottom pulley should be marked and referenced from. Once you are absolutely sure you know where TDC is you can check the ignition timing using the reference mark. 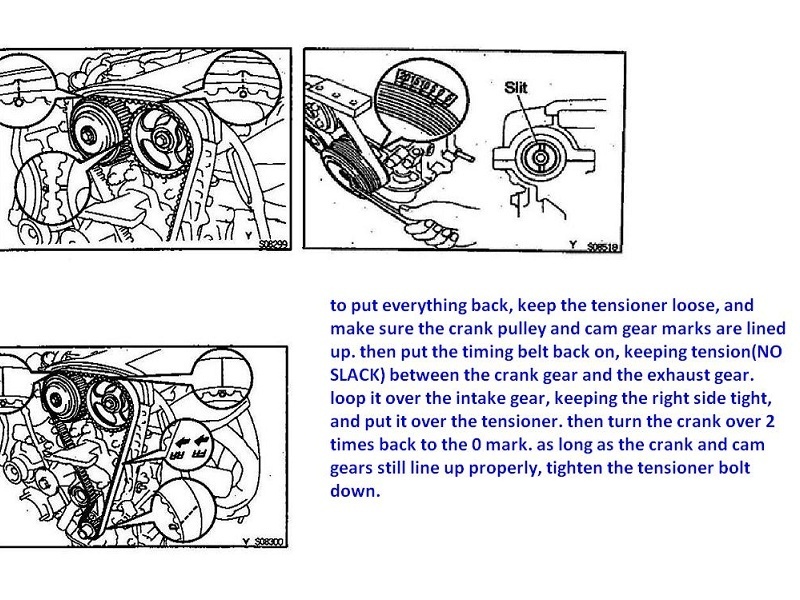 How are you checking the ignition timing off of the individual coils ? Woav ! Thank you man, I will try this tonight. Thanks for fast reply, you are rock. So in this position it is TDC right? In theory it is right but your TDC mark is on the bottom pulley attached to the crankshaft and it is the ignition timing from the bottom pulley that is probably causing your problem. It is not a good idea to run the engine for too long with this particular issue as you can burn out the exhaust valves. Should be ok to run it long enough to sort the timing though. Which standalone ecu are you using ? I'm using Beast. Turkish brand but same as VEMS. My theory is: In tdc position paint new mark at 0 degree on Crank Pulley, that is what I have got..
To be honest I can't remember if the engine is at compression TDC when the cams are aligned. Ignoring the cam / crank relationship for a minute it is possible by using the ecu to advance the ignition timing by say 10°as a test. We tried by using ECU whole day, nothing, still glowing... Because we dont know the advance settings, we are using notch for 16v i think. Hate T3 Pulleys, If you dont point for 4age 20v then why do you sell for 20v? damn. Hmmmm.... have you confirmed that the piston is @ TDC when you are checking cam timing?? Crank key should be pointing straight up... but even that can still be off. Only way to KNOW TDC is with a piston stop, and a timing wheel. There is also something wrong in the blacktop manual (I remember a thread about it) concerning cam timing - but this error was so extreme, I believe the engine doesn't run - so not likely your issue. oldeskewltoy wrote: Hmmmm.... have you confirmed that the piston is @ TDC when you are checking cam timing?? Oh really ?? things are getting harder and harder..
and set your ignition timing. 8-12 deg BTDC with the engine in diagnostic mode), AFTER removing the jumper wire ??? set without jumping to a higher value ??? out, the ECU adds the extra 6 or 7 deg to bring timing up to the required total timing. Turn crankshaft 4 time (to make sure) Match 3 points at cams. We put a screwdriver on Piston1. When at 3 marks matched position , screwdriver rising to max position. Then paint 0 degree at crank pulley, set timing to 10 degree.. Glowing looks gone, tested 15 min, we can touch headers.. But our idle is too high 3000rpm I think it s about compression, we blocked to ISCV pipe set to idle 900. For now thank you all guys! At this point be very careful about putting the engine under load as the high idle suggests that the ecu initial timing is out, it is crucial that the ecu sees the same ignition timing as the engine is actually running. Refer to the ecu owners manual for help on how to set initial ignition timing. So for understanding, We have to see same ignition timing engine and ecu? Mehmaddict wrote: So for understanding, We have to see same ignition timing engine and ecu? Yes correct but adjust the ecu to match the engine. Ok but sorry I'm newbie, how can i know my engine timing? Is it for 10? Bosch 2-wire valve if you don't have the Toyota ISCV. There are 1001 videos on Youtube explaining the procedure, take your pick ! You may have issues getting a signal from the individual coil pack but watch one of the videos first to understand why. Last edited by totta crolla on Wed Oct 11, 2017 2:04 am, edited 1 time in total. You will need a timing light, a small bright mark (white paint) on your bottom pulley at '0' (TDC) and a reference mark on the engine. See post above. Got it, Thank you, Project will be updated ! Hello and thank you all guys.. I set timing at 8 degree(Our fuel in Turkey is 95 Octane, car runs perfectly at 8 degree), after diagnostic mode we can see 15-16 degree (which is good). And ECU mode we setted 29 degree at trigger wheel setup. Tested on road no glowing, Temp is good, Runs smoothly and perfectly. Thank you all again, Espacially totta crolla ,I will make a video about it. My pleasure, glad it worked out for you. Nice car and engine by the way ! totta crolla wrote: My pleasure, glad it worked out for you. Jondee, I am not sure about blacktops, but I am almost 100% confident that the silvertop adjusts to a higher value once the jumper is pulled out. It has been a while but I am pretty certain that was the case when I adjusted it last time. unable to put the engine into diagnostic mode for any reason. I will check timing again, When we set 10 degree in diagnostic mode, Mark must be 16 degree? Btw with this setup car runs perfectly and smoothly.